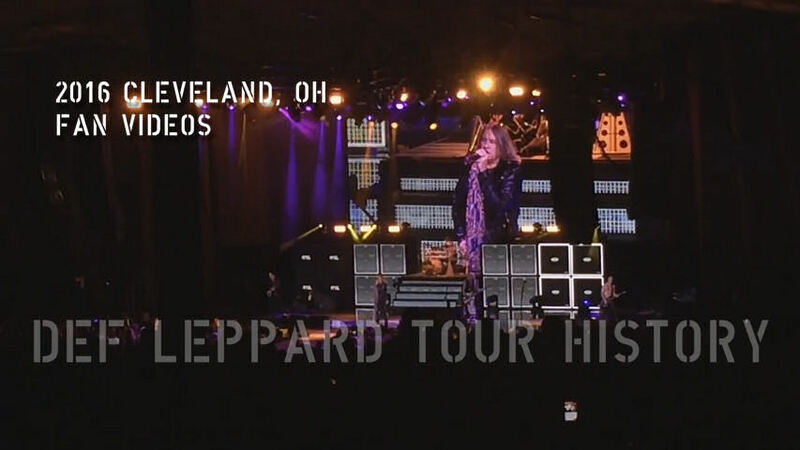 Def Leppard played a 2016 Summer Tour show last night in Cleveland, OH with 17 songs performed. The show took place at the 23,000 capacity Blossom Music Center. 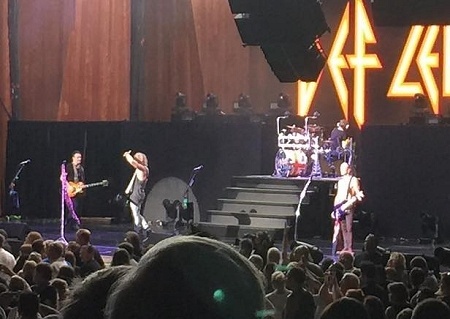 The band's first time in Cleveland since 26th August 2014 on the Summer Tour 2014 with KISS. The 18th show the band have played in Cleveland and 10th time at this outdoor venue. The first visit here took place in July 1980 at Municipal Stadium. Their first ever stadium show in front of almost 49,000 fans as support to Bob Seger at the World Series Of Rock show. They returned later the same month to play with Judas priest/Scorpions at the Public Hall. A High 'n' Dry tour show took place in September 1981 with Blackfoot. Their run of four support shows ended at Richfield Coliseum in March 1983 during the Pyromania tour with Billy Squier. The first headline show was an In The Round gig on the Hysteria tour at the same venue in February 1988. They came back on the same tour in July 1988 for their first ever visit to Blossom Music Center. The In The Round and outdoor show double at the same venues happened again in October 1992/July 1993 on the Adrenalize tours. Three shows at this venue then took place in 1996, 2000 and 2003 before the March 2003 Gund Arena show on the X/Ten tour. Four more shows at Blossom followed in 2006, 2007, 2009 and 2011. The second of only two indoor shows since 1992 then took place in July 2012 at Quicken Loans Arena on the Rock Of Ages tour before the ninth Blossom visit in 2014. Taylor Swift guitarist Paul Sidoti attended the show and was pictured backstage with Joe, Phil and Vivian. Paul was one of the performers at the CMT Crossroads taping with Taylor Swift in October 2008. One of only two band members from that time who are still part of her band along with bassist Amos Heller. Phil and Debbi Blackwell-Cook performed with Tesla for a third time. "Are you guys having a good time so far?. Alright well we're gonna do something real special for ya right now. We've got a brand new album called Mechanical Resonance LIVE!. It's celebrating 30 years of Tesla. There's a brand new song on there written by our good friend Phil Collen from Def Leppard. And right now we're gonna bring Phil and Debbi from Delta Deep out to jam with us on this song. Is that OK with you?. Phil Collen and Debbi Blackwell-Cook. We're gonna play our brand new single for ya. This is called Savge That Goodness." "Cleveland, Ohio. Or wherever you are from, if you have travelled to be here with us tonight. Take cake. We'll see you next time. Goodnight!." The next show takes place on 31st August in Darien Center, NY. Played for the first time in Cleveland.